Apple Inc. spent more on its lobbying efforts during President Donald Trump's first year in office than it had in any year previously, according to disclosures. The tech giant, whose CEO Tim Cook has strongly opposed Trump's policies, has spent $5.5 million lobbying D.C. entities through the first three quarters of 2017 and is on pace to top $7 million by the end of the year, easily eclipsing its previous high of $4,670,000 last year. The company deployed eight in-house lobbyists to Capitol Hill to lobby on issues such as immigration and tax reform, disclosures show. The company also retained the help of 31 outside lobbyists from Capitol Tax Partners, Fierce Government Relations, Franklin Square Group, DLA Piper, and the Glover Park Group, all D.C.-based firms, who were paid between $120,000 and $270,000 to lobby Congress, a number of government agencies, and the Trump administration. Apple's vice president of environment, policy, and social initiatives is Lisa Jackson, former EPA chief in the Obama administration. She manages worldwide government affairs in that role. 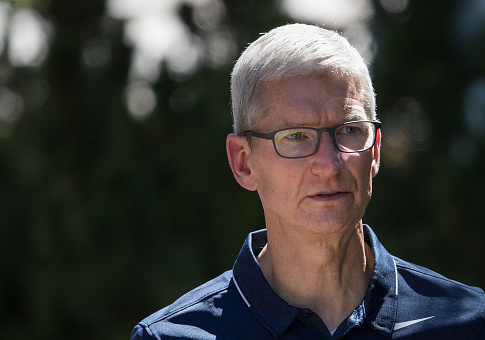 Cook has taken steps to appease the communist government in China amid falling iPhone sales while simultaneously criticizing Trump's policies in the United States as his company was lobbying the executive office. Cook, who says his company stays out of politics, criticized Trump's efforts to withdraw from the Paris climate accord earlier this year. "I think it's not in the best interest of the United States what he decided," Cook told Bloomberg. "But in terms of, ‘do you interact with politicians or do you not,' my view is that first and foremost things are about, can you help your country and if you can help your country and you do that by interacting, then you do it. The country eclipses politics." Cook personally tried to convince Trump to remain in the agreement, according to reports at the time. Cook also told employees in August that the company would donate $1 million to the Southern Poverty Law Center (SPLC), a liberal nonprofit best known for its "hate map" that positions mainstream conservative organizations alongside actual racist groups, following the tragic events in Charlottesville. Cook also placed a donation button for the SPLC in its iTunes store. Cook later attacked Trump over his position to end the Deferred Action for Childhood Arrivals program (DACA) while calling for its extension. Cook, whose company employs hundreds of DACA beneficiaries, vowed to pressure politicians on the issue. Apple did not return a request for comment on its lobbying efforts by press time. In addition to Cook's criticism of Trump's policies, employees at his company have donated overwhelmingly to Democrats since the 2004 election cycle, records show. Individuals at Apple have contributed a total of $161,410 to political candidates to date this election cycle, according to data compiled by the Center for Responsive Politics. Of this amount, $148,151 (92 percent) has gone to Democrats while only $5,628 has gone to Republicans. This entry was posted in Issues and tagged Apple, Lobbyists, Tim Cook. Bookmark the permalink.